Bean Jelly, or ‘cold starch-noodle’, is a fairly firm, semi-translucent, tofu-like food made from boiling bean starch in water until it thickens, and then cooling and unmolding it. The surprisingly sturdy bean jelly can then be cut into slices, julienned, or planed off into noodle shapes, and forms the basis for many cold dishes, usually involving some combination of soy sauce, vinegar, chile oil, ground pork, green onion, cilantro, sesame, and peanuts. Though bean jelly is firm enough to sauté, its cool mouthfeel and refreshing texture make it most popular as a cold plate, in warm weather. Almost tasteless, it is a pleasing carrier of savory sauces and toppings. The universal, globally available bean starch is mung bean starch, which is the source of the liáng fĕn served in most of China’s restaurants, as well as what is sold in Asian groceries everywhere. Mung bean starch produces a semi-translucent white jelly. 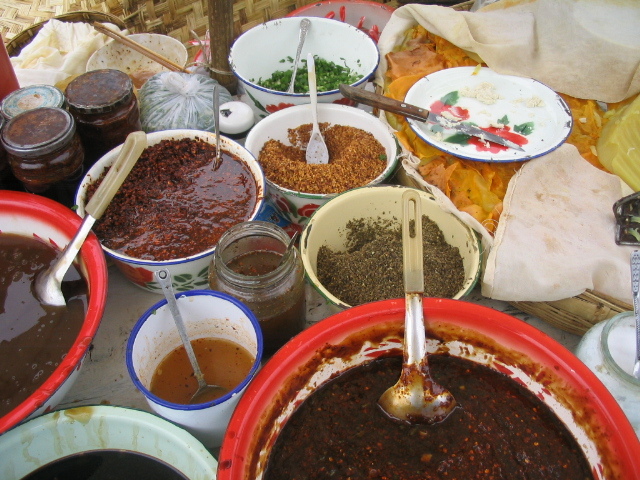 But in remote, rural parts of China such as Yunnan, locally grown beans are still used to make bean jelly, with some dramatically varied results. Yunnan is a province tucked away in China’s southwest corner and bordered by Laos, Myanmar, and Tibet. Connecting its main towns like a north-south sine is the ancient Tea and Horse Caravan Trail, used by muleteers continuously for almost 1400 years (618 CE—1950s CE) to ferry trade goods between Kunming and Lhasa. Towns grew up along the Trail, marketplaces thrived, and bean jelly became an enduringly popular dish, one quickly assembled, and thus perfectly suited to sale in market squares and street stalls. The market towns along the Trail had different cultures, different languages—and different bean jellies. 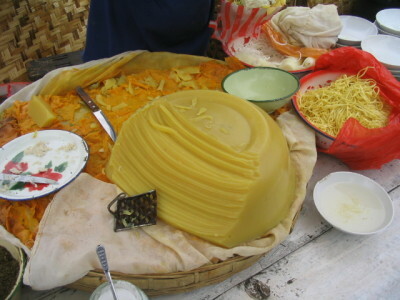 To this day, the Bai ethnic group around the town of Dali uses a local bean called wan dòu, which produces a buttercup-yellow jelly so firm it can be planed into long noodles (the town’s celebrated “yellow bean noodle”), or even cut into thick bread-like slices, between which the pastes and toppings are sandwiched, before the whole thing is eaten out of hand. To the north, where the Trail passes through the town of Lijiang, the Naxi people use a completely different bean, one they call ji dòu, which results in a mottled gray-green jelly that is usually cut into julienned shapes or slices rather than noodles. These towns along the Tea and Horse Caravan Trail do not just prepare bean jelly differently—each also has its signature heritage bean. Bean jelly is easy to make at home from mung bean starch, and toppings can be tailored to taste. While bean jelly functions like pasta, as a base for sauces and toppings, it is lower in calories and carbohydrates than regular pasta.